As the lights are turned on for Christmas all over the country, Eric Pickles urges councils to take pride in Britain’s Christian heritage. He called for them to celebrate the nativity and all the traditions that have sprung up around it from tinsel and tree lights to turkey. The minister insisted multi-cultural Britain has much to enjoy at Christmas time without abandoning its underlying Christian heritage in a misguided attempt to appease ‘politically correct Grinches’. Mr Pickles also reminded councils that Christmas is one of the biggest annual boosts to the high street economy. Christmas shoppers are a major source of revenue to local shops and council-owned car parks. 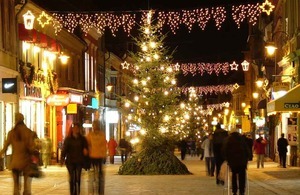 Councils that embrace the spirit of the season and bring Christmas to town, from luminous lights to competitively priced car spaces are likely to bring in revenue which helps support frontline services and keep council tax down. “We should actively celebrate the Christian basis of Christmas, and not allow politically correct Grinches to marginalise Christianity and the importance of the birth of Christ. The likes of Winterval, Winter Lights and Luminous deserve to be in the dustbin of history.